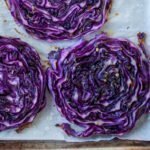 Oven roasted cabbage steaks are one of the easiest yet most visually impactful and tastiest cabbage dishes you’ll ever make. Not even an ounce of exaggeration here – try them for yourself. Whether you enjoy them as a side dish or turn them into an appetizer topped with sour cream and bacon bits – you will love the flavors. This post showcases red cabbage steaks just because they are so visually pleasing. No hard feelings towards regular white cabbage – it works just as well so don’t discount it as an option. 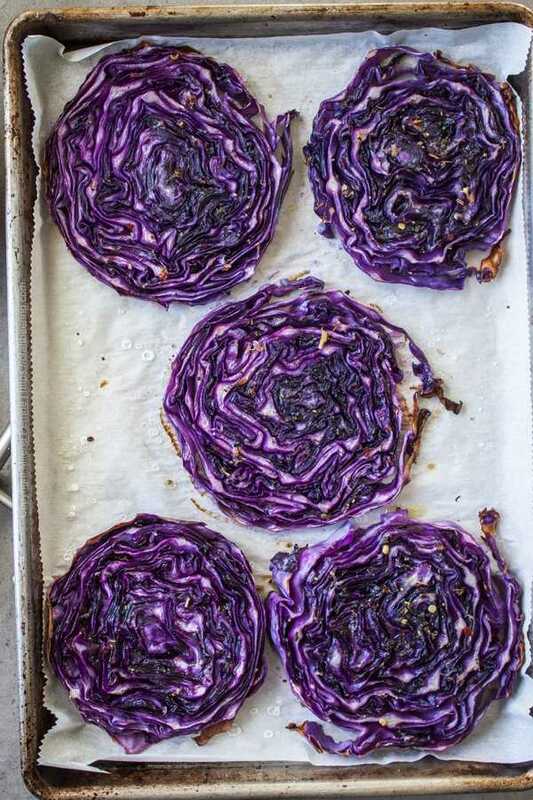 To make delicious roasted cabbage steaks all you have to do is slice some cabbage into about an inch thick wheels, brush the wheels with seasoned oil and then roast them. In approximately twenty minutes you’ll get gorgeous roasted cabbage slices with crispy edges that everyone is going to want to try. Cooking cabbage in the oven can definitely lead to culinary glory. Choose medium sized cabbage heads. If you can comfortably hold the entire head with your hand it is much easier to cut it. 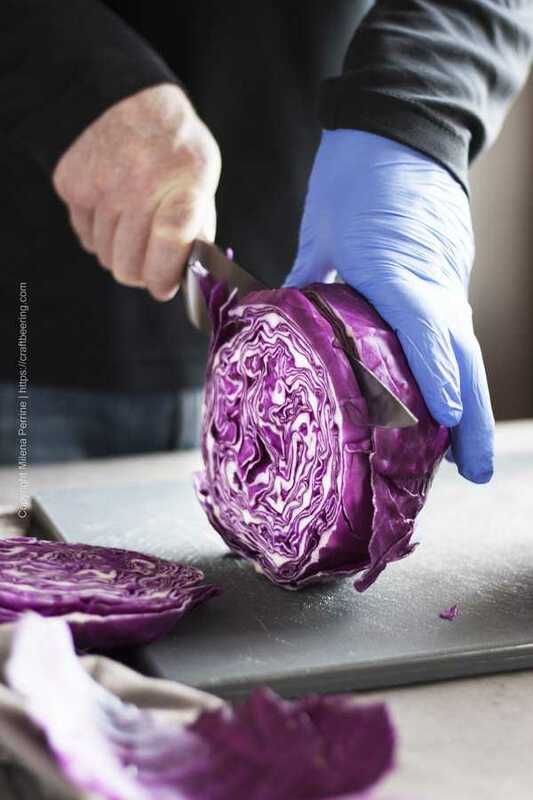 To cut the cabbage into wheels steaks be sure to use a well sharpened chef’s knife that is long enough to handle the job. Remove and discard the outer leaves. Firmly press onto the cabbage head with one hand and cut an inch thick slices. NOTE: If you begin cutting at the top of the head (the opposite of the root end) and progress towards the root end you will avoid the really thick parts of the core. Discard the end piece. Then next step is to brush the steaks with olive or vegetable oil before roasting them. You have the option to infuse them with a lot of flavor so make the most of it. 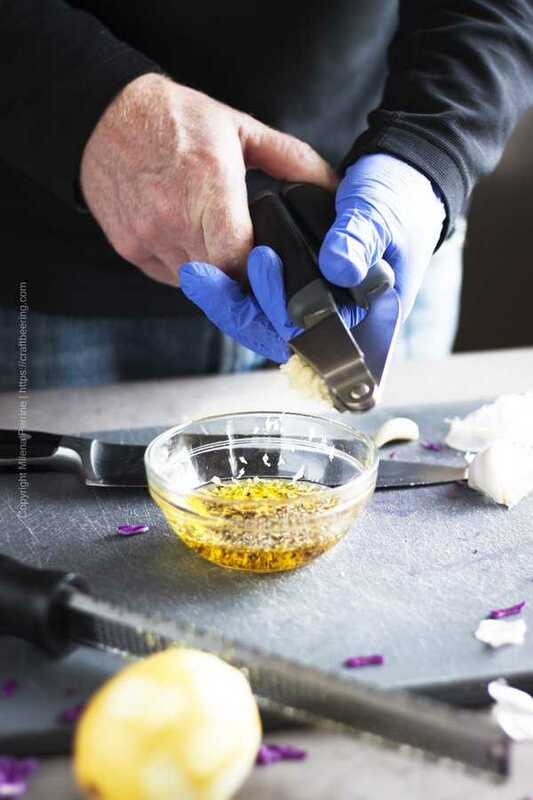 Measure out three tablespoons of oil and season it with salt and pepper. Then add whatever other spices you are in the mood for or in accordance with the end purpose of your roasted cabbage steaks. For example, if you will be enjoying them as a side dish to pork – complimentary spices and herbs would be cumin, oregano, ground caraway seed, maybe some ground mustard seed or a spoonful of mustard. We went with lemon zest, garlic and red chili flakes in addition to the salt and pepper because we were going for an appetizer. Next, arrange the steaks onto parchment paper lined baking sheet and generously apply seasoned oil over them. Allow them to sit for a minute so the oil can get into all the twisty crevices. At what temperature to roast the cabbage steaks? Anywhere from 375 to 400 F depending on your oven’s calibration and how thick you cut the cabbage. Serve the roasted steaks right away as a cabbage side dish to meats – from pork roast or bratwursts to corned beef on St. Patrick’s Day. They also happen to make a great warm salad when garnished with green onions, cilantro or parsley and a drizzle of ranch or blue cheese dressing. Alternatively you could present them as an appetizer – top your cabbage steaks with bacon and a dollop of sour cream – they lend themselves really well to acidity. Or – do as we did. Given how much we enjoy flavoring food with craft beer we frequently have beersamic reduction in the fridge. 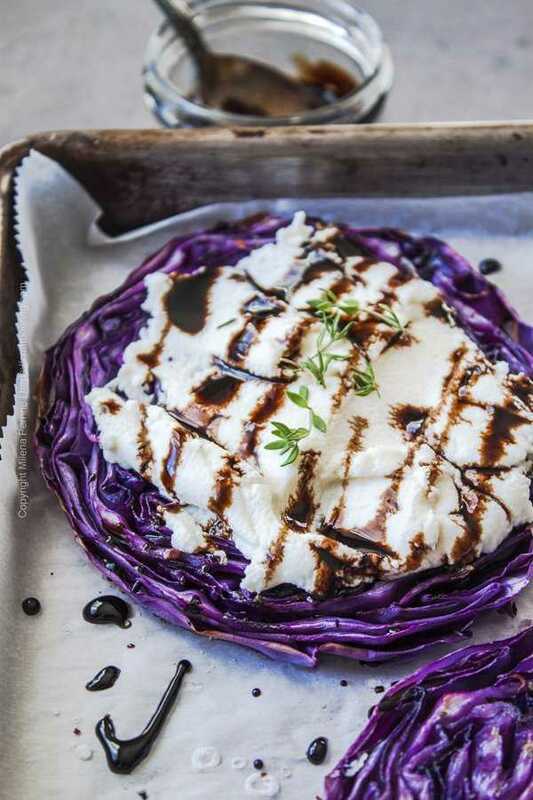 We finished off our roasted red cabbage steaks with a slathering of ricotta and a drizzle of beersamic. TIP: Beersamic is a reduction of craft beer and good balsamic vinegar with complex malty sweet and tangy flavor. Making it is very easy – learn how. 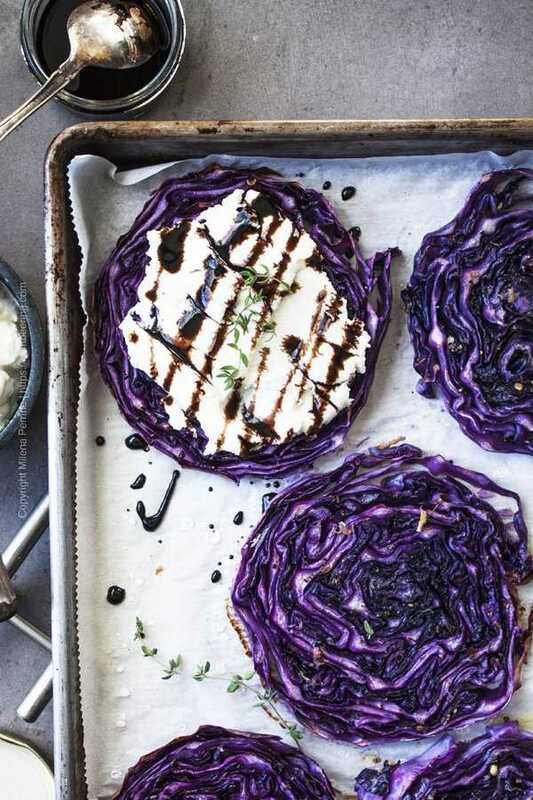 Roasted cabbage steaks are a breeze to make, delicious and visually impactful. Enjoy them plain as a cabbage side dish or garnished as an appetizer or a warm salad. Preheat your oven to 400 F (or 375 F if your oven is really strong). Line a baking sheet with parchment paper and set aside. Arrange the cabbage steaks onto the parchment paper lined sheet. Mix the oil, salt and pepper and the seasonings of your choice. Brush the cabbage steaks with the seasoned oil. Roast for 18-20 minutes or until you notice that the outer edges are nicely crisp and the surface begins to caramelize. Serve as a side or top with your choice of toppings and enjoy as an appetizers or a warm salad. *Depending on the actual cabbage head size and exactly how thick you sliced it you can obtain 4 to 6 usable 'steaks'. We note 5 as an average. Nutrition information is for a single cooked cabbage steak, excluding any toppings or garnishes. Can I Grill Cabbage Steaks? Absolutely. You can easily make grilled cabbage steaks. Cut the cabbage in the same manner as shown above and carefully brush each wheel with seasoned oil on both sides. Grill over medium heat for about 5 minutes on one side then flip to finish on the other side for about 2-3 minutes. Quite delicious indeed:) And it’s so easy to infuse them with different flavors. Thank you, Nicoletta! Oh my oh my…this is sooo beautiful. 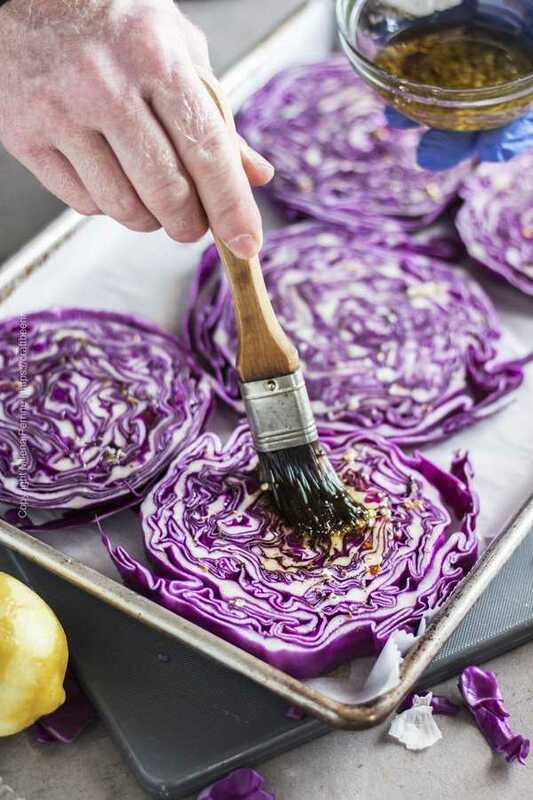 Love the natural purple color of the cabbage and I’m sooo going to try this. I have a cabbage, not purple though, but I bet it works with regular cabbage too. I’ve been seeing cabbage steak forever but haven’t gotten a chance to try! I’m not convinced! This has my name written all over it! Not only for the color (OH MAN!) but roasted veggies make me very happy! This is happening!! Lol, definitely striking color-wise when you pull them out of the oven! Love cabbage, but somehow never roasted it like this before in steak form. I do make cabbage rolls and sometimes when they bake they get little bits of crispy edges that I love so I’m sure I’d really enjoy these cabbage steaks, especially with balsamic. Pinned! I love cabbage and I love roasted veggies so how have I never thought to roast cabbage? This sounds fantastic! I’m definitely going to try it soon.